Hiking a trail long the Continental Divide in Montana’s Glacier National Park a few days ago. I met a female mountain goat and her month-old baby coming the other way. I stepped off into a clump of stunted fir trees. The pair passed quite close, the little one keeping a wide eye on me all the while, as it trotted at its mother’s heels. Two miles farther along, a male goat occupied the trail. I sidehilled around that animal through an avalanche chute crowded with yellow glacier lilies and red Indian paintbrush. This was turning into my kind of hike, making room for mountain goats being my idea of a fine way to spend a day, maybe even an ideal way. 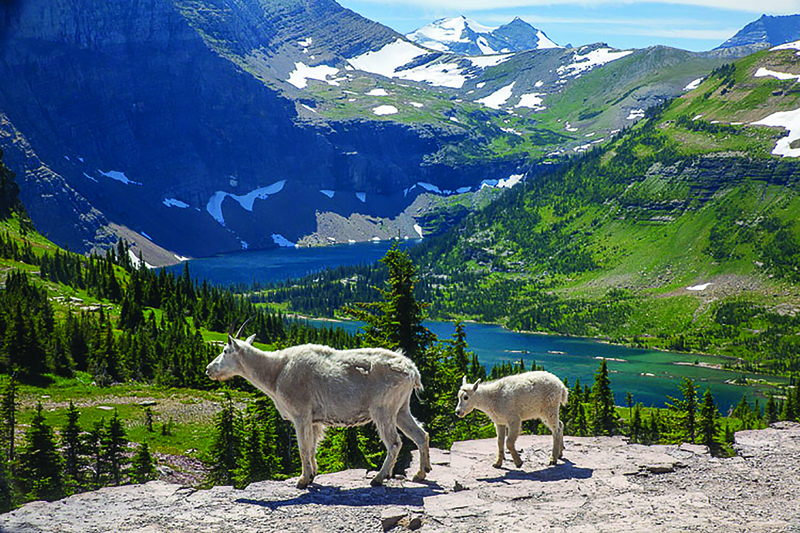 Mountain Goat Nanny and her Kid traversing rocky terrain above Hidden Lake in Glacier National Park. Nearly thirty years have passed since I began a scientific study of mountain goats and fell in love with their top-of-the-world home. When people ask which areas I enjoyed most among those that I have been to my answer is: the places where mountain goats dwell. Besides I owe a debt to these shaggy white climbers that winter near the continent’s crest. Whatever skills I have for backcountry fieldwork and observation, I developed in their company. In North America there is one large animal that belongs almost entirely to the realm of towering rock and unmelting snow. Pressing hard against the upper limit of life’s possibilities, it exists higher and steeper throughout the year than any other big beast on the continent. It is possibly the best and most complete mountaineer that ever existed on any continent. Oreamnos americanus is its scientific name. The process of creation is more clearly on display than usual toward the uppermost edge of the life zone, from the way frost and gravity transform colossal stone ramparts into the first, thin layers of soil to the way extreme conditions constantly test animals, leaving the fittest to reproduce their kind. 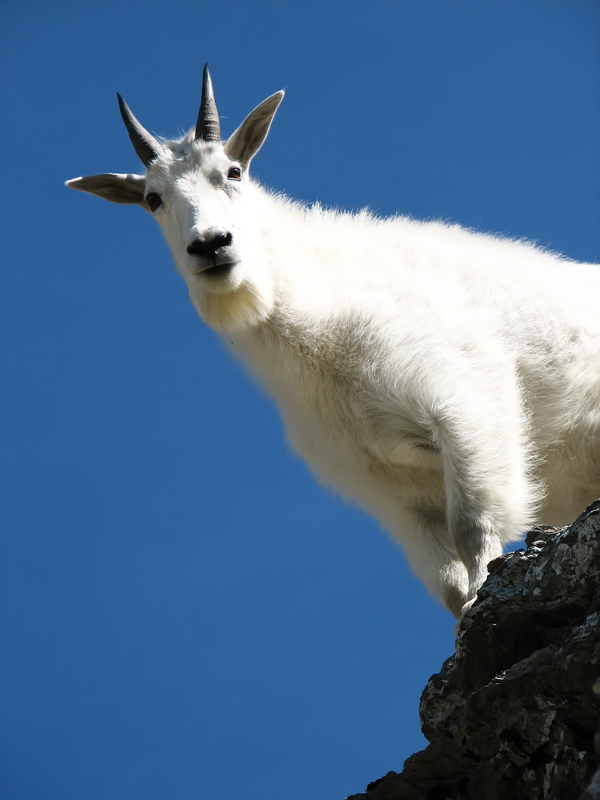 Watching the crucial give and take between mountain goats and their vertical environment made the concepts of adaptation and natural selection as real as a move down an ice-cloaked rock face. The white goat occupies an ecological position somewhat similar to that of the mammals at the top of the food chain: the big predators. Having few effective enemies, the large carnivores also must partially regulate their own numbers. Mountain goats grow and reproduce more slowly than most hooved game species. Mountain goat females almost never have been found to breed before two-and-a-half years of age, even under optimum conditions. Fighting among mountain goats plainly is a ritualized affair. Haphazard battling would be next to suicidal for the sharp-horned goats since a singular puncture anywhere could lead to serious infection, and a thrust into the chest or thin-walled belly could mean quick death. Mountain goats, however, tuck their chin down and then jerk up with a prod, a stab, a piercing hook. The mountain goat’s system of fighting therefore orients weapons away from the head, while substituting intense threats for actual contact. Each behavior pattern conveys a certain amount of information by itself. The function of the present-threat being to intimidate, it speaks the superior’s language: taut and inflated, assured, ready for action. The low-stretch, on the other hand, serves to increase a billy’s chances of being allowed within the personal space of one of the most aggressive of ungulate females during the breeding season. A goat performs a predictable routine whenever it lies down. It sniffs the ground while circling a bit, like the family dog; scrapes the ground, favoring the uphill hoof on tilted spots, thus helping level the bed or remove stones, sniffs again; kneels, sometimes checking the scent again, then lies down all the way. The rest depends on how much the goat feels in need of a dustbath. It may go at it so hard, alternately scratching with its rear feet and horns and sending up plumes of powdered soil, that it scoops out a wide, dusty pit in the slope. And it keeps dustbathing off and on in bed; even more on hot, buggy days. I was lying on my back in a meadow one afternoon when I was awakened for a sound that turned out to be Gore (a very large billy) snipping grass a foot away from me. I lay still and looked at him and our eyes met. Then he stepped right over me and continued grazing, pausing once to look back at me. His tail was tucked down the entire time, betraying not a milligram of fear. What was it about this huge billy? He, and he alone, trotted back and forth across the pass keeping an eye on the whereabouts of all the other goats. He also kept track of the hikers. Then I recognized that he was acting rather like a billy does, during the rut. The first threat was subtle enough. He merely stood in my way, refusing to give way. I had to go around him to proceed. The next I hardly noticed. The third was a present-threat he made sure I noticed. I was walking alongside a nanny, taking notes. Gore appeared beside me just within my personal space. His tail was rucked down and he slightly tensed. He watched me intently but made no further move, so I ignored his stare-threat and turned to see what the nanny was doing. The next thing I knew, I was being lifted up with a horn in my knee and spilled onto my back. It was not a vicious thrust. By Gore’s standards it was probably more like a warning prod. But it had gone right through my soft hide, and only the leg bone close to the surface at the knee had kept it from penetrating more deeply. Thereafter I had a new place in goat society and insight into its workings. 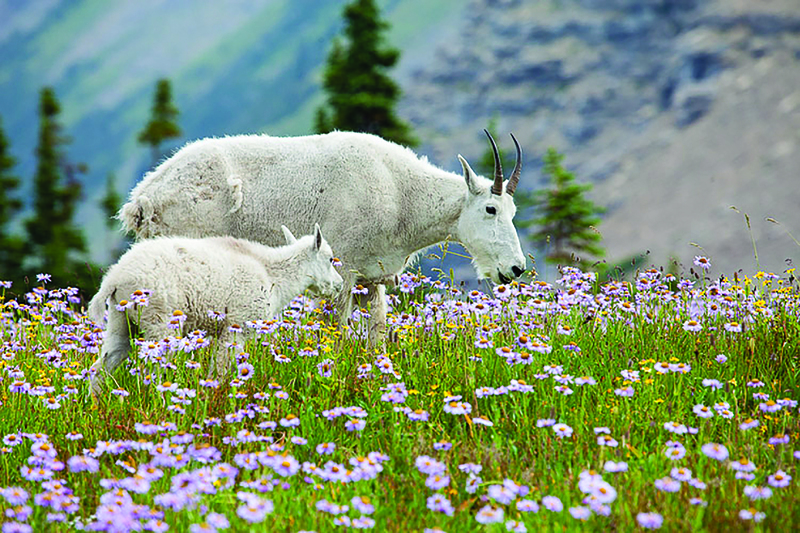 Global warming is bound to have consequences for mountain goats, which follow the retreating snow line upward during summer and have a tough time dealing with heat. Largely confined to mountaintops to begin with, herds stand to see their ranges reduced along with the ability to move between areas and exchange genetic material.